This ruined towerhouse is famous for being the first reported use of seige-guns in Ireland, when Lord Deputy Kildare besieged and captures this castle in 1488l. The castle was the seat ofthe barons of Ballymagarvey in the 18th century. 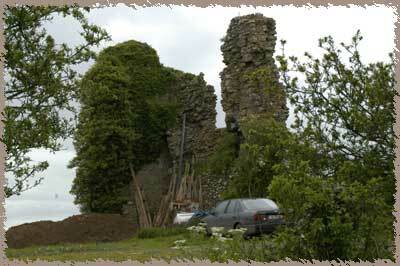 The castle lies on the edge of the Balrath woods (probably named after the Baron of Balrath. Only a few walls of the castle remain; the courtyard is now part of a farm.